The Mars Global Surveyor (MGS) Mars Orbiter Camera (MOC) experiment consists of 3 different cameras: a narrow angle imager that provides the black-and-white high resolution views (up to 1.4 meters per pixel) of Mars, and 2 wide angle cameras, observing in red and blue wavelengths, from which color views of the entire planet are assembled each day. The wide angle cameras provide a daily record of changes in martian weather and surface frost as the seasons progress. 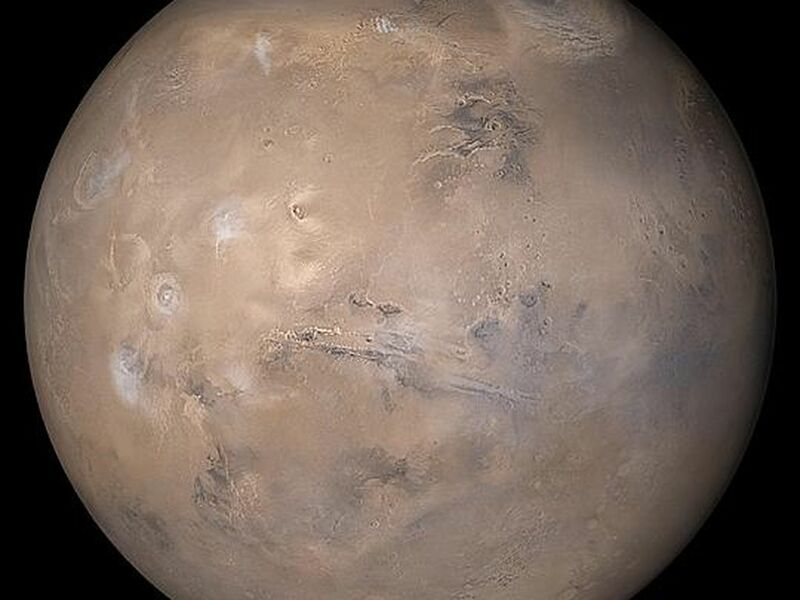 MGS MOC has obtained a record of martian weather spanning a little over 2 martian years since it began systematic observations in March 1999. 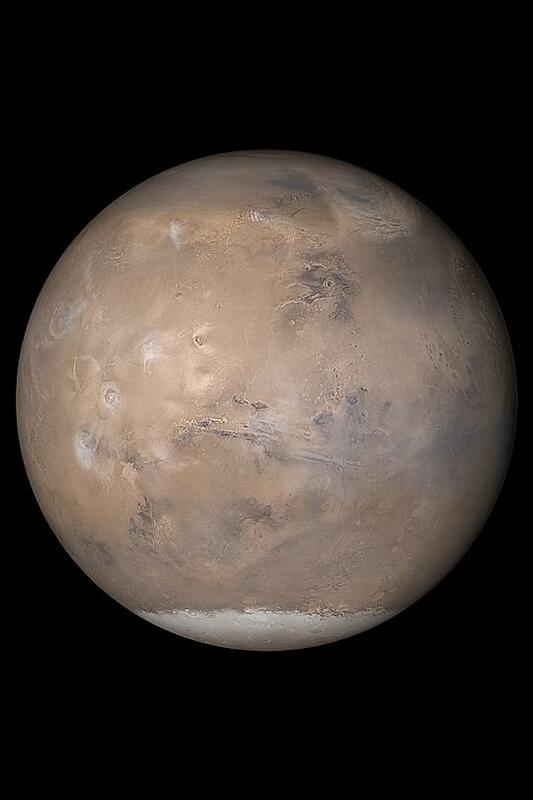 The view of Mars shown here was assembled from MOC daily global images obtained on May 12, 2003. At that time, the northern hemisphere was in early autumn, and the southern hemisphere in early spring. 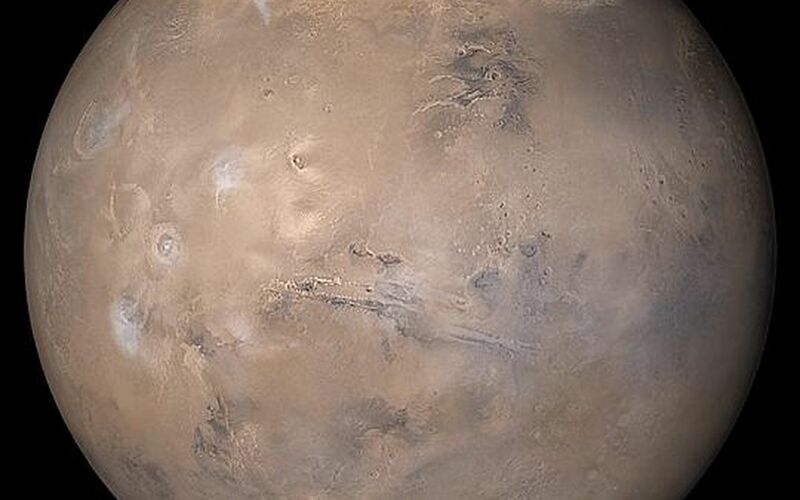 At the left/center of this view are the four large Tharsis volcanoes: Olympus Mons, Ascraeus Mons, Pavonis Mons, and Arsia Mons. 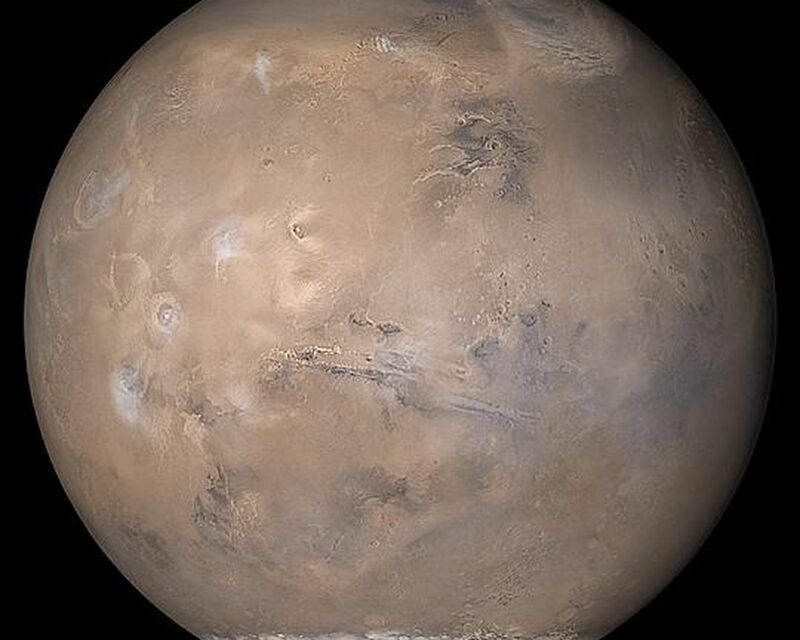 Stretching across the center of the globe is the ~5,000 kilometers (~3,000 miles) long Valles Marineris trough system. The seasonal south polar carbon dioxide frost cap is visible at the bottom of this view. A dust storm sweeps across the plains of northern Acidalia at the upper right. North is up, east is right, sunlight illuminates the planet from the left.